When it comes to excellent accommodation, the small Oxfordshire town of Woodstock definitely punches above its weight. And to a list which includes iconic hotels such as The Bear and Feathers, one can add Hope House. 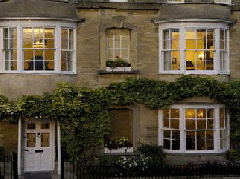 Probably best described as a ‘Boutique B&B Hotel’, the property is one of only a few houses in Woodstock designed in the Vanbrughan style – one of the others, of course, is Blenheim Palace. Constructed in 1708, the building was originally owned by a local councillor and mayor. Indeed, the no-expenses-spared ethos is reflected in the fact that its three suites are all between 60 and 80 square metres in area. And few bed & breakfasts can claim that. The Marlborough Suite (second floor) boasts original oak roof beams, while the Churchill Suite (first floor) possesses some fine panelling. The Blenheim Suite (ground floor) features a four-poster bed and is every inch the 18th century luxury bedroom, antiques and all. There are numerous places to eat and drink in Woodstock itself (Hope House prides itself on being within 500 metres of some 14 ‘eateries’), and plenty of classic old inns in which to imbibe in the surrounding area.